Today’s the birthday of longtime Superman foe Mr. Mxyzptlk, per the 1976 DC Calendar. As longtime Superman fans know, Mr. Mxyzptlk, or “Mxy” for short, is an imp from the fifth dimension. Mxy visits Earth to use his vast reality-altering magical powers to pull pranks on, and otherwise challenge, Superman. 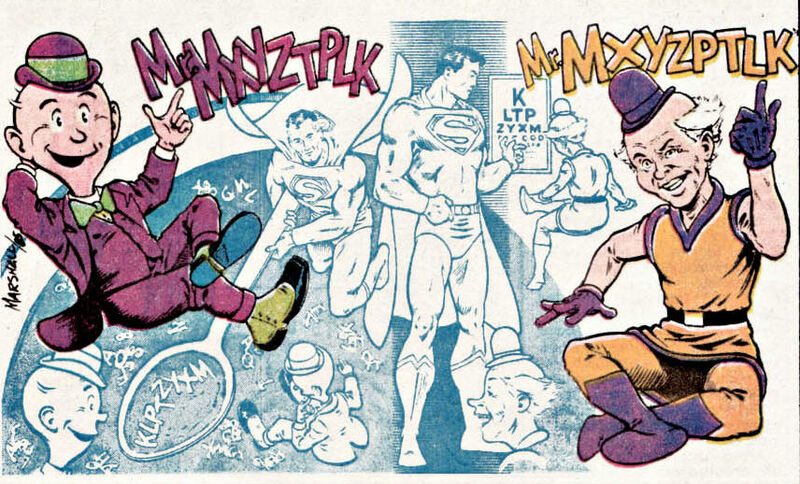 Superman can usually only get rid of Mxy by tricking him into saying or spelling his name backwards, which sends Mxyzptlk back to his home dimension for 90 days (and usually undoes his magical effects). Mxy still appears in modern stories, but less so than he once did. I assume it’s from a mix of DC Comics’ current comic tone and their heavier emphasis on Batman-related characters. Related to the latter is fellow imp Bat-Mite and his own resurgence in popularity recently, to the point he got his own miniseries in 2015. Here’s a look at my favorite stories featuring Mxy, showing his range of magical antics. “Superman” #30 (Sept. 1944) was the first appearance of Mxy. Here, he shows up and pulls all manner of magical hijinks: bringing a statue to life; building a highway clear out into the middle of a lake; and blowing papers all over the city, which leads to a battle with Superman’s own super-breath. Mxy’s clearly inspired by the zany theatrical animated characters of the day, such as Woody Woodpecker and Daffy Duck. “Superman” #96 (March 1955). Art by Al Plastino. In the story “Mr. 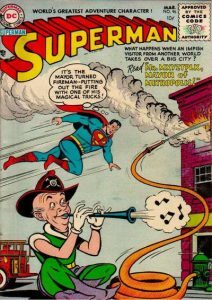 Mxyztplk: Mayor of Metropolis,” Mxy shows up in Metropolis and (via magical antics) gets himself elected mayor. He then takes over all of Metropolis city workers’ jobs using his powers; Mxy’s means of stopping crime (as the police force) or putting out fires (as the fire department) causes Superman no end of grief. 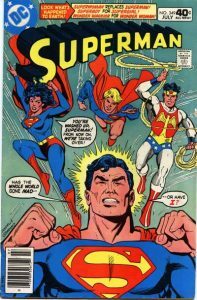 A fun story, though it’s usually not reprinted; the issue’s lead story, “The Girl Who Didn’t Believe in Superman,” instead is reprinted fairly often in collections. For pedantic fans, whether this story takes place on Earth-1 or Earth-2 is debatable. “Who’s Who” (and some other DC sources) states the Earth-1/Silver Age Mxy first appeared in 1959’s “Superman” #131. As such, a few sites deem “Superman” #96 is an Earth-2 tale. On the other hand, “Superman” #131 involves Mxy seeing a newsreel of the time he ran for mayor (plus flashbacks to a few other mid-to-late 50s-era Mxy stories). The DC Wiki (and a few other online sources) thus feel it’s an Earth-1 tale. My answer? It’s either: an Earth-1 story, with Golden Age spellings/costume colors ignored; or an Earth-2 tale, with the newsreel in “Superman” #131 just referencing some near-carbon copy Earth-1 version of events. I lean toward the latter. In the story “The World of Mr. Mxyzptlk,” Superman finally turns the tables on Mxy after his latest round of magical pranks goes too far. This time, Supes visits the fifth dimension, where he proceeds to harass Mxy the way Mxy does to Superman on Earth. (Mxy is also again running for mayor, this time in his native dimension.) As such, Mxyzptlk tries to trick Superman into saying or spelling his name backwards, but doesn’t have much luck. “Superman” (vol. 1) #349 (July 1980). Art by Ross Andru. In “Superman” #349, Superman returns from space to find Earth is changed into a gender-reversed Earth, whose heroes include Superwoman (a female Superman), Superlad (a male Supergirl), and Wonder Warrior (a male Wonder Woman). Said world also had a Batwoman (a female version of Bruce Wayne, not Kate Kane), a female Flash, and a Black Condor (a male Black Canary). “Superman Family” #208 sees the final pre-Crisis appearance of Earth-2’s Mxyztplk. Here, he manages to bring Earth-2’s married Lois Lane and Clark Kent to his own dimension (as part of a plane full of passengers). Superman pulls some “psychological warfare” on Mxy (who didn’t want to be reminded of anything about Supes at the time) and gets Mxy to send everyone back home. This classic story by Alan Moore and Curt Swan appeared in “Superman” #423 and “Action Comics” #583, both published in September 1986. This story (a non-canonical “imaginary story”) told the final tale of the SIlver Age Superman, plus cast a darker light on Mr. Mxyzptlk’s nature. In this Christmas-themed story, Impulse runs across the Earth trying to fill in for Santa Claus to Plastic Man’s dismay (long story). In the process, he runs across Mr. Mxyzptlk. Hijinks, of course, ensue. Mxy shows up for a not-malevolent purpose, this time imagining for Clark and Lois what the couple having a kid might be like. Cue a parody of popular newspaper comic “Calvin and Hobbes,” with Mxy in the “Hobbes” role to a hypothetical daughter of Lois and Clark. The final issue of this “Super Friends” children’s comic sees Mxy and various other DC Comics imps—including Mopee (from the Flash), Quisp (from Aquaman), Bat-Mite, and even Shaggy the Leprechaun (from Golden Age Wonder Woman comics)—all go to a comic-con for fun. While the other imps try to enjoy themselves as regular con attendees, Mxy goads them into misusing their powers. Luckily, the Super Friends fix everything. “Superman: The Animated Series” features my favorite non-comics version of Mxyzptlk. Gilbert Gottfried voiced the imp (here in his Golden Age tuxedo) in his two episodes on this series. Honorable mentions go to Mxy’s appearances on “Super Friends” and the 60s Filmation Superman series—both my first (and main) exposures to the fifth dimensional imp as a kid. Hi, are there any reprint collections containing multiple stories of GA or SA Mxy? No Mxy-specific volumes I can think of, though there’s usually a Mxy story or two in some Superman collections.